Rockie was a good sport, but damn that thing is fun. Duel ? That was a Bushwhack ! I said "Or Not!" Sheesh! You had a chance to bring a nerf gun, but nooooooooooooo. Wtf was that thing, and what was it shooting? Looked like sharpened pencils. That was a full-auto nerf-dart gun. You've got to get one. 2G, my grandsons gave me that for Christmas so we'd all have one. Imagine a full-auto nerf war on Christmas afternoon in the backyard. All of us with 3 mags of 18 rounds each. Somehow, somewhere, that much fun is probably illegal. It's also an awesome tool to keep the cats and the dog in line in the house without having to get up. However, if you say you want one on the forum and a certain person has your phone number, you might get a call from Yellow Freight. 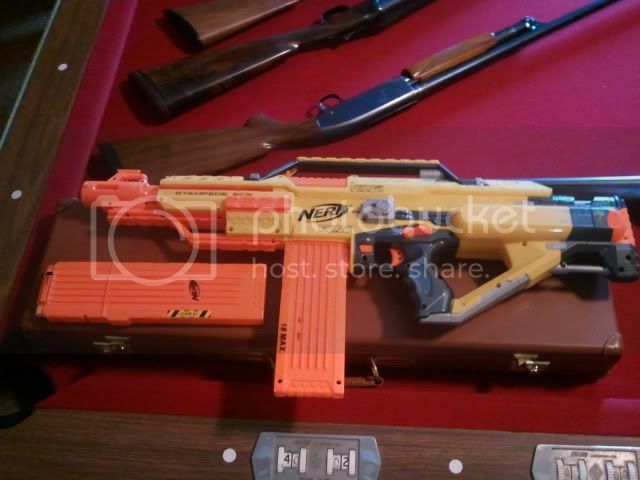 That is the Nerf Stampede Blaster. The French-fitted, leather-covered case (with assessories) is a nice touch. I can see that. That thing's got fun written all over it. Years back, my wife and I got the nephews a "Lazer-Tag" setup, with the guns, reflectors and stuff. That got us "Most Favored" status for a long time. I can see that weapons technology has made great advances in the intervening years. They have a belt fed model too. The belt fed is better for static defense, the magazine fed one better for "on the move." You say that only because you don't have a belt fed model. Besides, both Rambo and Arnold proved you wrong in many movies. I say that because my grandsons have one of each and neither of them wants to get stuck with the belt-fed model when we play war.